WE MAKE OUR WINNERS EVEN BETTER. TRY TRUE ANATOMICAL FIT. 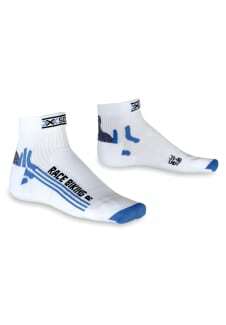 The X-SOCKS Bike Racing model is especially lightweight and is cut lower than our other biking models. The lightweight fi nish provides optimal contact from the foot via the shoe to the pedal, ensuring excellent control and optimal transmission of power. A complex system of padding reduces pressure in exactly those areas where shocks and friction are greatest, effectively diminishing the risk of sustaining pressure points and skin abrasions. The climate-controlling materials and the “Air” ventilation system create a dry, climatized, and temperature-controlled environment for your feet, even under extreme conditions.